Ford Motor Company is exploring how large-scale one-piece auto parts, like spoilers, could be printed for prototyping and future production vehicles, as they are the the first automaker to pilot the Stratasys Infinite Build 3D printer. 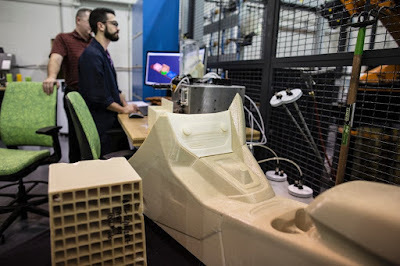 Capable of printing automotive parts of practically any shape or length, the Stratasys Infinite Build system could be a breakthrough for vehicle manufacturing, providing a more efficient, affordable way to create tooling, prototype parts and components for low-volume vehicles such as Ford Performance products, as well as personalized car parts. The new 3D printer system is housed at Ford Research and Innovation Center in Dearborn. 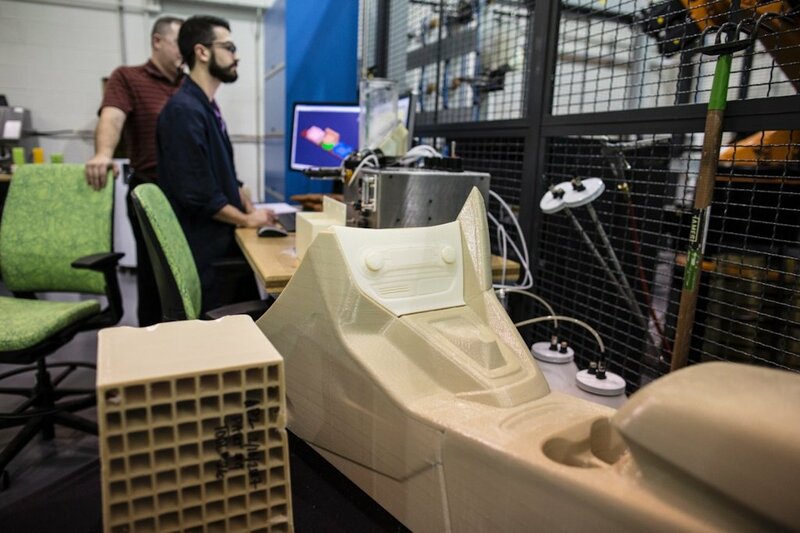 3D printing could bring immense benefits for automotive production, including the ability to produce lighter-weight parts that could lead to greater fuel efficiency. A 3D-printed spoiler, for instance, may weigh less than half its cast metal counterpart. The technology is more cost efficient for production of low-volume parts for prototypes and specialized race car components. Additionally, Ford could use 3D printing to make larger tooling and fixtures, along with personalized components. With 3D printing, specifications for a part are transferred from the computer-aided design program to the printer’s computer, which analyzes the design. The device then goes to work, printing one layer of material at a time, then gradually stacking layers into a finished 3D object. When the system detects the raw material or supply material canister is empty, a robotic arm automatically replaces it with a full canister. This allows the printer to operate unattended for hours – days, even. 3D printing is not yet fast enough for high-volume manufacturing, but it is more cost efficient for low-volume production. Additionally, minus the constraints of mass-production processes, 3D-printed parts can be designed to function more efficiently.